Produce better results in less time when grading your Google Classroom, Docs & Drive student files. 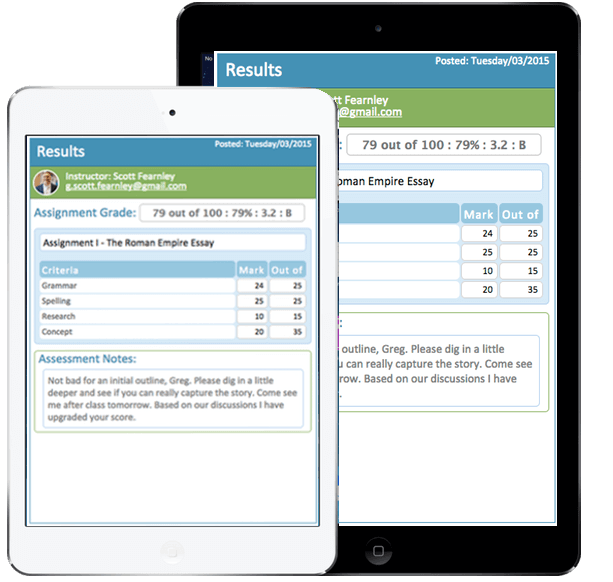 Trade in those time expensive efforts managing your student work today and experience our refreshing, streamlined, rubric driven 21st century solution. &ast;Gradelicious will always be free for teachers and students! Yep, we did the math and many teachers are spending as much as 45% of their grading time on tasks other than grading. Crowded desktops overflowing with application windows & browser tabs. Confusing repetitive mouse-clicking, copying, pasting & reconciling. Complicated ad hoc document and student data management. 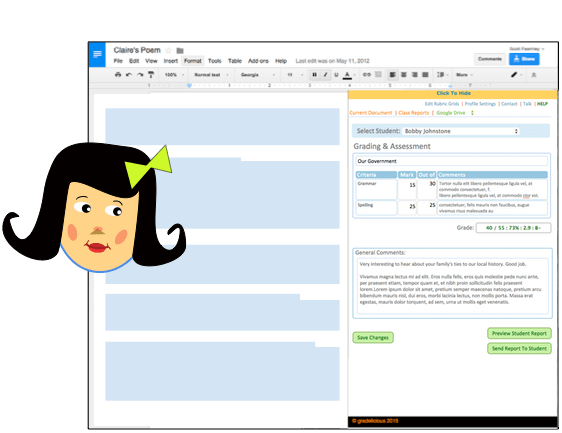 "I&apos;d be crazy not to use Gradelicious"
Streamline your grading process with Gradelicious! 100% web based - you can grade anytime! Uses rubric grids & comments for grading. Secure one click sharing of results with students. Automatically creates & then maintains roster based class and assignment grading records, so no data uploads! Gradelicious is always there when you look at your student assignments, it’s simple to use, and will help you get the job done. You grade. We’ll keep you organized. Gradelicious works with your Google Drive and Google Classroom to automatically create, maintain, and save all your grading records for every assignment and class. Save your work and with one click Gradelicious notifies your students. No emails, messages or lists to manage means no hassles and no wasted time. 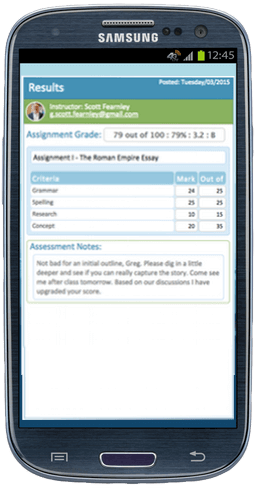 Students can view Assignment reports on their PCs, iOS or Android devices without installing additional apps, extensions or downloads. All they need is a web browser and an Internet connection. Google and the Google logo are registered trademarks of Google Inc., used with permission. 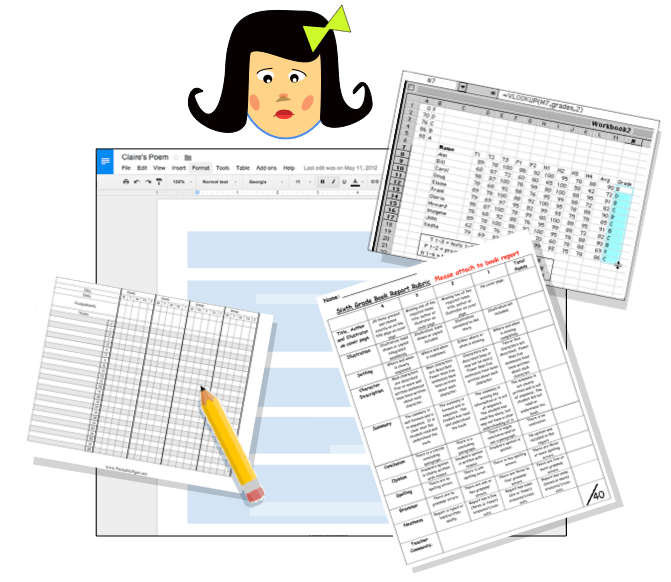 Power up your grading with our Rubric Grid technology. 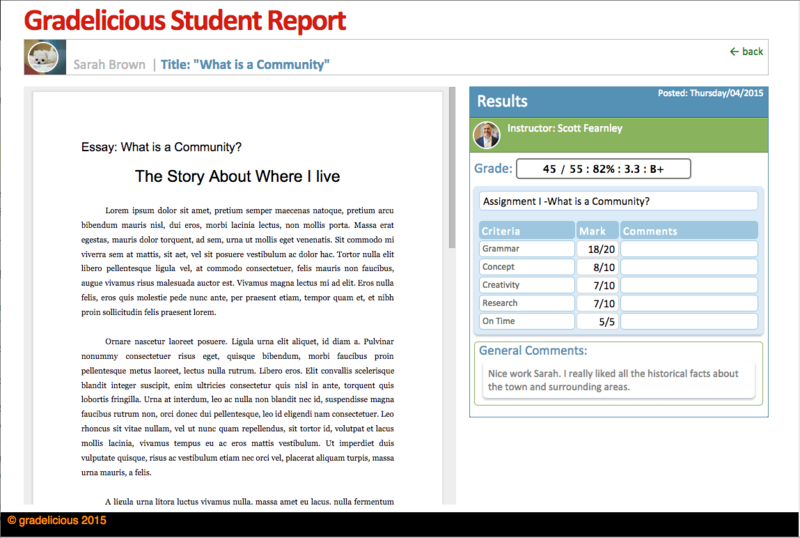 Use our editor to create student facing rubrics. We even let you re-use them as templates for other assignments. Take a juicy bite out of those long lost hours, yes we know there are a LOT of them. Experience immediate improvement to your overall efficiency while increasing the genuine quality of the time you spend on each student. We three are fathers, educators, product designers, musicians, artists and developers who share a mutual love for small footprint living in clean, rural places. We work virtually, bonded by our lifelong relationships. Community, nature and social justice; these are fundemental drivers that influence and guide our daily creative lives. We, over the last 20+ years, have built successful solutions for the classroom, the enterprise, and the consumer. Everyday we think about improving the education experience. Make a difference. Simplify the experience. Expand accessibility. Increase the meaningfulness of assessment and improve the quality of student-teacher exchanges. with your questions, comments or thoughts you have about Gradelicious. if you require assistance, or are having trouble installing and running the Gradelicious extension. Please note that this Site and App (the "Site and App") and Chrome© extension (the ‘App’) are in Beta and may contain errors, bugs, or other problems not usually associated with generally available Site and Apps and services. As with any webSite and App providing tools and information, there are rules about what you can and can't do, what we will and won't do, and what promises we do and don't make to you. Those are captured below in our Terms of Service. Please read them carefully because we want to be sure you understand and accept them before you use or App or register for this Site and App. The following terms constitute an agreement between you and Gradelicious, the operator of the Site and App ("we" or "us"). This agreement ("Terms of Service") governs your use of the Site and App, both as a casual visitor and as a registered user. The Site and App contains a range of information and tools relating to the environment and sustainability. The Site and App contains not only information posted by us but user submitted content as well. Content submitted by users is not reviewed or verified by us. We accept advertising on the Site and App, but try to be responsible in what we will and won't accept. We make sure that all ads are clearly marked. Everything we offer on the Site and App is referred to in these Terms of Service collectively as "the Services." These Terms of Service govern your relationship with us and our suppliers. We may change these Terms of Service at any time, as we deem appropriate. If we make changes that we believe will have a material impact on your use of the Site and App and Services, we will let you know by sending you an email if we have a current email address for you, and by noting on the Site and App that the Terms of Service have been updated. If you disagree with the changes to these Terms of Service, discontinue your use of the Site and App, or if you have registered with us, cancel your registration. We recommend that you print or copy any information you have stored through the Services prior to cancelling. Your ongoing use of any Service or of the Site and App after the changes take effect signifies your agreement to the new terms. We encourage you to review the Terms of Service regularly. In order to register, you will need a gmail account and will use your Gmail credentials to register and log into the Site and to download the App. These are your credentials for accessing Services that are only available to registered users ("Credentials"). As such your username will be based on that you have provided to Gmail and you may not use a username that is either vulgar, attempts to impersonate another person, or violates the rights of others. You are responsible for all use of the Site and App and App and Services using your Credentials, including use by others to whom you have given your Credentials. You are responsible for keeping your password confidential and for notifying us if your password has been hacked or stolen. You may use the Site and App and App and Services for lawful, non-commercial purposes only. When participating in our communities or providing ratings, you must comply with our Posting Guidelines. You may not use the Site and App and App in any manner that could damage, disable, overburden, or impair our servers or networks, or interfere with any other party's use and enjoyment of the Site and App and App and Services. You may not attempt to gain unauthorized access to any Services, user accounts, or computer systems or networks, through hacking, password mining or any other means. We may take any legal and technical remedies to prevent the violation of this provision and to enforce these Terms of Service. You may not use any robot, spider, scraper or other automated means to access the Site and App and App or Services for any purpose without our express written permission. You agree not to violate any of our robot access policies and acknowledge that any violation of the policies may result in termination of your access to the Site and App, deactivation or deletion of your registration and all related information and files you have stored, and preclusion of any further access to such files or the Site and App. We may from time to time add new Services, substitute a new Service for an existing Service, or discontinue an existing Service. Information about new Services will be included on the Site and App, and the use of new Services will be governed by these Terms of Service. The Site and App may include links to other websites, including links provided as automated search results. Some of these sites may contain materials that are objectionable, unlawful, or inaccurate. These links are provided for your convenience only and do not mean that we endorse these Site and Apps or the products and services they provide. You acknowledge and agree that we are not responsible or liable for the content or accuracy of these other Site and Apps. Certain Services or features on the Site and App may have additional terms (such as policies, guidelines, and subscription terms) that will further govern your use of the particular Service and supplement these Terms of Service. If you choose to register for or access any such Service, you will be presented with any relevant additional terms and conditions at that time. By using those Services, you agree to comply with such additional guidelines and rules. The Site and App includes community areas, such as forums where registered users can post messages, information, and other content ("Postings") that can be accessed and viewed by others, including the public in general. When you submit Postings keep in mind that they are not confidential. Please be thoughtful with your Postings, and avoid offending others or infringing their rights. You may only post Postings to public areas on the Site and App that you created or that you have permission to post. You may not post Postings that violate these Terms of Service or our Posting Guidelines, and we reserve the right to block your ability to post and/or to access the Site and App and Services if you do. You may also have the opportunity to submit ratings of users, content or other material. Your ratings are considered Postings and must comply with our Posting Guidelines. It is important that you act responsibly when providing these ratings. Please give clear, honest information but do not use inappropriate language or make gratuitous personal criticisms or comments. You (or the author) continue to own the copyright in your Postings but, by submitting Postings to public areas of the Site and App, you grant us and our affiliates the right to use, copy, display, perform, distribute, adapt, translate, edit, and promote your Postings in any medium, and to use your display name to attribute your postings to you if we so choose. While some community areas may be monitored for topicality, we have no obligation to pre-screen Postings, and are not responsible for their content. We encourage you to notify us of inappropriate or illegal content in community areas, and we reserve the right to remove Postings for any reason. We are not, however, responsible for any failure or delay in removing Postings. Keep in mind that the Postings of others are simply their opinions and you should not rely on them. In addition to Postings, you may submit feedback to us. We welcome your feedback regarding our Site and App and Services. You agree that we may use in any manner and without limitation all comments, suggestions, complaints and other feedback you provide relating to the Site and App or Services. All of the written and visual materials, data, tools, and design elements (the "Content") available on or through the Services and/or the Site and App are owned by us, our suppliers, and our contributors, and are protected by copyright, trademark, patent, trade secret, international treaties, laws and other proprietary rights, and also may have security components that protect digital information. We give you permission to use the Content for personal, non-commercial purposes only. You may print, download, and store articles and other information for your own convenience, but you may not distribute, republish, sell, mine, exploit, duplicate, frame or scrape any of the Content, or exploit the content for commercial gain. We accept advertising that complies with our Advertising Policy. Please keep in mind that any dealings that you have with advertisers found on the Site and App are between you and the advertiser and you acknowledge and agree that neither we nor our suppliers are liable for any loss or claim you may have against an advertiser. The link must be a text-only link clearly marked "www.gradelicious.com". The link must "point" to www.gradelicious.com and not to other pages within the Site and App. The appearance, position and other aspects of the link may not be such as to damage or dilute the goodwill associated with the Gradelicious© good name and trademarks. The appearance, position and other aspects of the link may not create the false impression that an entity is associated with, sponsored by, or endorsed by Gradelicious©. The link, when activated by a user, must display the Site and App full-screen and not within a "frame" on the linking website and linking may not trigger any interstitial or pop-up or pop-under windows. We reserve the right to revoke consent to the link at any time in our sole discretion. If we revoke such consent, you agree to immediately remove and disable any and all of your links to the Site. From time to time, we may offer and/or co-sponsor contests, sweepstakes, and games on the Site and App. Each of these activities shall be governed by specific rules accessible from the page offering the contest, sweepstakes, or game, and which will be presented to you at the time you choose to participate in a contest, sweepstakes, or game. The Site and App and Services, including the information provided on the Site and App, are designed for and intended for users in Canada. We make no representation that the Site and App or Services are applicable to, appropriate for, or available to users in locations outside Canada. Accessing the Site and App and Services from territories where the content is illegal is prohibited. If you choose to access the Site and App and Services from a location outside Canada, you do so on your own initiative and you are responsible for compliance with local laws. WE PROVIDE THE SITE AND APP AND THE SERVICES "AS IS", "WITH ALL FAULTS" AND "AS AVAILABLE". WE AND OUR SUPPLIERS MAKE NO EXPRESS OR IMPLIED WARRANTIES OR GUARANTEES ABOUT THE SERVICES. TO THE EXTENT PERMITTED BY LAW, WE AND OUR SUPPLIERS DISCLAIM IMPLIED WARRANTIES THAT THE SERVICES ARE MERCHANTABLE, OF SATISFACTORY QUALITY, ACCURATE, FIT FOR A PARTICULAR PURPOSE OR NEED, OR NON-INFRINGING. WE AND OUR SUPPLIERS DO NOT GUARANTEE THAT THE RESULTS THAT MAY BE OBTAINED FROM THE USE OF THE SERVICES, WILL BE EFFECTIVE, RELIABLE, ACCURATE OR MEET YOUR REQUIREMENTS. WE DO NOT GUARANTEE THAT YOU WILL BE ABLE TO ACCESS OR USE THE SERVICES (EITHER DIRECTLY OR THROUGH THIRD-PARTY NETWORKS) AT TIMES OR LOCATIONS OF YOUR CHOOSING. NO ORAL OR WRITTEN INFORMATION GIVEN BY A GRADELICIOUS REPRESENTATIVE SHALL CREATE A WARRANTY. You may have additional consumer rights under your local laws that this contract cannot change. You use the Site and App and the Services at your own risk. YOUR SOLE AND EXCLUSIVE REMEDY FOR ANY DISPUTE WITH US OR OUR SUPPLIERS IS THE CANCELLATION OF YOUR REGISTRATION. IN NO EVENT SHALL OUR AND OUR SUPPLIERS CUMULATIVE LIABILITY TO YOU FOR ANY AND ALL CLAIMS RELATING TO THE USE OF THE Site and App AND SERVICES EXCEED THE TOTAL AMOUNT OF FEES, IF ANY, THAT YOU PAID DURING THE PRIOR THREE MONTHS FOR THE SPECIFIC SERVICE AT ISSUE. WE AND OUR SUPPLIERS SHALL NOT BE LIABLE FOR ANY INDIRECT, SPECIAL, INCIDENTAL, CONSEQUENTIAL OR EXEMPLARY DAMAGES ARISING FROM YOUR USE OF OR INABILITY TO USE THE Site and App AND SERVICES. THESE EXCLUSIONS APPLY TO ANY CLAIMS FOR LOST PROFITS, LOST DATA, LOSS OF GOODWILL, WORK STOPPAGE, COMPUTER FAILURE OR MALFUNCTION, OR ANY OTHER COMMERCIAL DAMAGES OR LOSSES, EVEN IF WE KNEW OR SHOULD HAVE KNOWN OF THE POSSIBILITY OF SUCH DAMAGES. BECAUSE SOME JURISDICTIONS DO NOT ALLOW THE EXCLUSION OR THE LIMITATION OF LIABILITY FOR CONSEQUENTIAL OR INCIDENTAL DAMAGES, IN SUCH STATES OR JURISDICTIONS, OUR LIABILITY, AND THE LIABILITY OF OUR SUPPLIERS, SHALL BE LIMITED TO THE EXTENT PERMITTED BY LAW. We may terminate and/or suspend your registration immediately, without notice, if there has been a violation of these Terms of Service or other policies and terms posted on the Services by someone using your Credentials. We may also cancel or suspend your registration for any other reason, including inactivity for an extended period, but will attempt to notify you in advance of such cancellation or suspension. Your right to use the Services will end once your registration is cancelled or terminated, and any data you have stored on such a Service may be unavailable later, unless we are required to retain it by law. You may terminate your registration at any time by emailing us at support.gradelicious@gmail.com. We recommend that you transfer records or other information stored on the Site and App prior to terminating your registration. Upon a request by us, you agree to defend, indemnify, and hold harmless us, our employees, contractors, officers, directors, agents, parent, other affiliated companies, and suppliers, from all liabilities, claims, and expenses, including attorney's fees, that arise from your use or misuse of the Site and App and the Services. We reserve the right to assume control of the defense of any third party claim that is subject to indemnification by you, in which event you will cooperate with us in asserting any available defenses. Your affirmative act of using this Site and App and/or registering for the Site and App or Services constitutes your electronic signature to these Terms of Service and your consent to enter into agreements with us electronically. You also agree that we may send to you in electronic form any privacy or other notices, disclosures, reports, documents, communications or other records regarding the Services (collectively "Notices"). We can send you electronic Notices (1) to the e-mail address that you provided to us during registration, or (2) by posting the Notice on the applicable Service or otherwise through the Site and App. The delivery of any Notice from us is effective when sent by us, regardless of whether you read the Notice, when you receive it or whether you actually receive the delivery. You can withdraw your consent to receive Notices electronically by cancelling or discontinuing your use of the applicable Service. This contract and any supplemental terms, policies, rules and guidelines posted on the Site and App and the Services constitute the entire agreement between you and us and supersede all previous written or oral agreements. If any part of these Terms of Service is held invalid or unenforceable, that portion shall be construed in a manner consistent with applicable law to reflect, as nearly as possible, the original intentions of the parties, and the remaining portions shall remain in full force and effect. PLEASE NOTE THAT BY AGREEING TO THESE TERMS OF SERVICE, YOU ARE: (1) WAIVING CLAIMS THAT YOU MIGHT OTHERWISE HAVE AGAINST US BASED ON THE LAWS OF OTHER JURISDICTIONS, INCLUDING YOUR OWN; (2) IRREVOCABLY CONSENTING TO THE EXCLUSIVE JURISDICTION OF, AND VENUE IN, PROVINCIAL OR FEDERAL COURTS IN THE PROVINCE OF BRITISH COLUMBIA OVER ANY DISPUTES OR CLAIMS YOU HAVE WITH US RELATING TO OR ARISING OUT OF THE SITE AND APP, THE SERVICE OR THE AGREEMENT; AND (3) SUBMITTING YOURSELF TO THE PERSONAL JURISDICTION OF COURTS LOCATED IN THE PROVINCE OF BRITISH COLUMBIA FOR THE PURPOSE OF RESOLVING ANY SUCH DISPUTES OR CLAIMS. We may assign this contract at any time as part of the sale to, merger with, or other transfer of our company to another entity. We will post a notice on the Site and App regarding any change of ownership so that you have the opportunity to discontinue your use of the Site and App or cancel your registration if you do not wish to continue to use the Site and App and Services under the new ownership. You may not assign this contract to anyone else. Identification of the location where the original or an authorized copy of the copyrighted work exists, for example the URL of the webSite and App where it is posted or the name of the book in which it has been published. Identification of the URL or other specific location on this Site and App where the material that you claim is infringing is located; you must include enough information to allow us to locate the material. All trademarks appearing on the Services are the property of their respective owners, including, without limitation, Gradelicious. No right, license or interest to such trademarks is granted by this Agreement. Here at Gradelicious one of the most important things we can do for students is to guard their privacy and make sure that nobody takes advantage their personal information and data. We fully support, and implement, all of today's privacy intiatives including FERPA and the SIIA pledge to advance student data privacy. This policy discloses our current privacy practices; we will not make any changes to these practices without informing all of our users prior to making any material changes to this privacy statement and pledge. If you have any questions or concerns about our policy or its implementation, you may contact us at this email address: support@gradelicious.com. We collect personal and non-personal information to improve the usefulness of the content and services we offer to you. By knowing about you, we can deliver more helpful information, programs and tools, and offer you the most relevant services. We collect personal information when you voluntarily provide it to us or authorize us to collect it on your behalf. When you register, we collect personal information from you such as your email address and password. Registering allows you to access personalized features and content on our site on a recurring basis. Occasionally, you may be asked to give your opinion when you visit our site. We use information from opinion polls to better understand the needs of our users and to gather information about energy, environmental and sustainability trends and issues. Questions and answers are stored, but they will not be shared with third parties. When you visit our site, our servers will automatically collect log information. This information may include your web page request, Internet Protocol (IP) address, browser type, browser language, the date and time of your request and one or more cookies that may uniquely identify your browser. We collect log information so that we can properly administer our system and gather aggregate information about how our site is being used, including the pages visitors are viewing. We do not associate IP addresses with records containing personal information. We may collect anonymous information about your use of our site through cookies. The cookie will not tell us who you are. Only you can tell us that. The information collected by cookies will helps us generate content and also allows us to statistically monitor how many people are using our site and for what purpose. We do not store any identifying information in any cookies on your computer. Your browser software can be set to reject all cookies or to accept cookies only from our site. Most browsers offer instructions on how to reset the browser to reject cookies in the "Help" section of the toolbar. If you wish to opt out of participating in advertising programs conducted by Ad Networks, please go to the NAI Opt-Out site and follow the instructions on that site. After you opt out, you will continue to see advertising on Gradelicious, but this advertising will not be tailored to your web preferences and usage patterns. We may also use web beacons, sometimes called single-pixel GIFs, that momentarily direct your browser to a server other than Gradeliciousin a way that may not be apparent to you. Web beacons are used to count users who visited specific pages and determine which emails were opened and/or acted upon when we send HTML-formatted email messages. We will not link any identifying information to web beacons. When you make a purchase from us, we may use the personal information you provide to us to obtain additional information about people in your neighbourhood. This is average information for people who live within your postal or zip code. The information may include average household income, presence and age(s) of children, presence and age(s) of elderly parents, size and value of dwellings, and other census data. We may use this information, combined with information you provide to us and information collected by our systems, to better understand the characteristics of the visitors to our site and to develop new products, services and content areas. The information will also allow us to tailor content, advertising and offers to your interests and needs. Email communication that you send to us via the email links on our site may be shared with a Gradelicious representative or other employee. From time to time, we may send you service-related emails, such as a welcome email when you register with our site. When you invite a friend or family member to join our site, we will automatically send them an email invitation. We will not use their email address for any other purpose. At various places on the site, you may be given the option to receive recurring informational newsletters and to set alerts and reminders. You can unsubscribe from newsletters by clicking on the unsubscribe link at the bottom of any newsletter. Our site may include and feature community areas where people with similar interests can share information. Please remember that any information that you disclose in community areas is, by design, open to other members of Gradelicious. We know how important it is to keep the information you've entrusted to us confidential. We will not rent, sell or share identifying information about you with third parties unless you request a product or service from us and we need to share your information to fulfill your request or under certain circumstances as described below. In all other cases, we will ask for your permission before we disclose your personal information. We may release personal information to third parties: (1) to comply with valid legal requirements such as a law, regulation, search warrant, subpoena or court order; or (2) in special cases, such as a physical threat to you or others, a threat to our system or network, or cases in which we believe it is reasonably necessary to investigate or prevent harm, fraud, abuse, or illegal conduct. In the event that we are legally compelled to disclose your personal information to a third party, we will make reasonable efforts to notify you unless doing so would violate the law or court order. Contractors sometimes have access to your personal information in the course of assisting in operating our business and providing products or services to you. These contractors include vendors and suppliers that provide us with technology, services, and/or content for the operation and maintenance of our site. Some of these relationships may be with companies who co-brand portions of their site and services, or who provide services to you on our behalf. Access to your personal information by these contractors is limited to the information reasonably necessary for the contractor to perform its limited function. For your convenience, we may provide links to sites operated by companies that are not affiliated with our site and that do not have contracts to provide content or services through our site. These links may be found in advertisements, referenced within content, included in community profiles, or placed beside the names or logos of sponsors. We do not disclose your personal information to these third-party web sites without obtaining your permission. Before providing any information to these linked sites, we encourage you to read their privacy policies. We provide secure sign-on to our site. What you can do to help keep your information secure? Always create a password that's easy for you to remember but difficult for someone else to figure out. Don't use your name, address, phone number, initials, Social Security number, license plate or birthday. Don't use names of your friends, family, or pets, company names, common numerical sequences or the word password. Viruses are dangerous. Many viruses are sent as email attachments. They can slip into your system without your knowledge the moment you open the email. Some viruses such as Trojan Horses can capture the contents of your system, including your passwords. Installing up-to-date antivirus software and running it will help thwart these and other unwanted programs. Personally identifiable information we collect from children under the age of 13 will be used solely by Gradelicious or its agents for internal purposes only and will NOT be sold or otherwise distributed to third parties. We will NOT knowingly allow children under the age of 13 access to chat rooms, message boards, email accounts, or other services within Gradelicious that would allow them to publicly post or otherwise distribute personally identifiable information without prior verifiable consent from a parent or guardian. Upon request, Gradelicious will provide a parent with a description of the information that may have been provided about their child during a registration process for a program or service of this site. Gradelicious only asks for a child's or teen's personal information if it is necessary to participate in the program or service. Before any personally identifiable information is collected, we will do our best to notify the parent or guardian that their child is participating. Notification will include the exact nature and intended use of the information we are collecting, as well as the opportunity for the parent or guardian to prevent the use of the information and the child's participation in the activity. For every child (anyone under 13 years of age) we require the parent or guardian to provide verifiable parental consent such as an email, mail-in letter, fax, or toll-free phone call to Gradelicious.